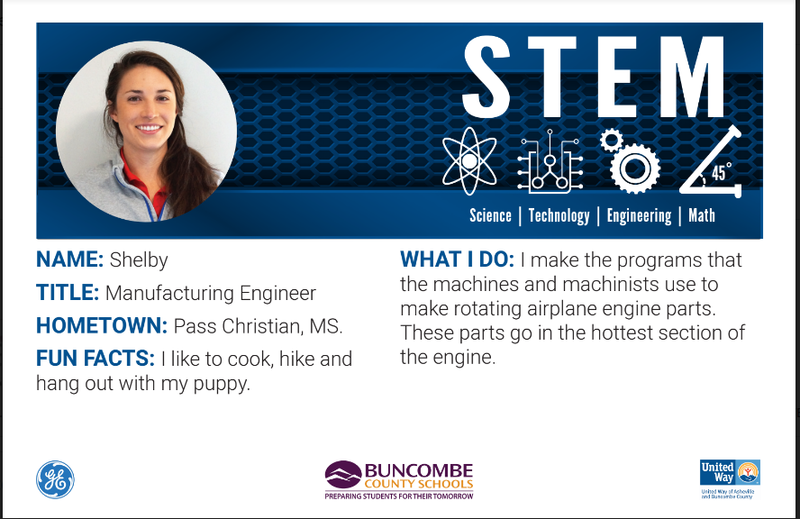 When Sarah Congleton, Lead Production Quality Specialist at GE Aviation in Asheville, learned that students begin thinking about whether they want to go to college in middle school, she naturally thought about how to more positively reinforce that decision for Asheville and Buncombe County students using science, technology, engineering and mathematics (STEM) education. Volunteer Engagement Director Michelle Bennett saw a need based on United Way of Asheville and Buncombe County’s community school work and connected GE Aviation with Buncombe County Schools staff around the concept of partnering to develop a STEM Kit that would serve as an inspirational project for local students. “Yes, sixth grade is the year that kids get turned on or off of science, so if we can hook them in earlier with something from the real world, then maybe we can help them better make that decision,” shares K-12 Science Specialist for Buncombe County Schools Brian Maccarelli. While STEM learning is vital within the school curriculum, it’s also important that extracurricular activities and “informal interactions with family, peers, and community members also help to reinforce that interest and learning. Both the availability and accessibility of these experiences depends as much (or more) on the income level as the interest level of both students and parents,” according to the ‘State of STEM’ white paper by STEMconnector, citing research from writer Robert Putnam in his New York Times Best Seller ‘Our Kids: The American Dream in Crisis (an informative read if you’re interested in understanding how socio-economic status and race have impacted education throughout history). 200 GE STEM Kits will be distributed in a handful of Asheville City and Buncombe County Schools this winter, including Oakley Elementary and Montford North Star Academy, to students in 4th and 7th grade. Two different kits have been created: one containing a map with challenge questions, taking students on an adventure around N.C. Students will map routes across the state and use their math skills to calculate distance traveled. The second project is a car creation kit where students take on the task of learning to engineer a rubberband-powered vehicle using small wooden wheels, dowel rods, and rubber bands. They'll use the scientific method to hypothesize the effects of wheel size on distance traveled by the makeshift vehicle. Within each kit students will also receive a profile card designed by United Way of Asheville and Buncombe County, featuring a GE Aviation employee, sharing their name, title, a deeper understanding of how their role helps support the production of airplane parts manufactured by GE and a few of their personal hobbies. The GE STEM Kit Project is part of Hands On Asheville-Buncombe’s We Care Experience offerings, which bring community needs in the form of projects to groups wanting a shared volunteer experience. These unique opportunities are facilitated on-site at the business, youth club, church group or nonprofit organization with education about the larger need in the community alongside an activity that everyone is able to work on together, producing a tangible product at the end of the project that helps fill a community need. We Care Experiences have included creating snack packs for middle school students facing food insecurity, personal care kits for homeless students, care kits for families made homeless due to domestic violence, and more. STEM Kit creation will now be a part of these project offerings. We Care Experiences are just one tool used by Business United to help local organizations and businesses make a meaningful impact in the community through volunteerism. Business United partnerships offer a variety of projects and opportunities designed to help students excel in the classroom and succeed in life — all while helping businesses integrate volunteerism as a tool to enhance overall employee job satisfaction. DONATE to support the work of United Way of Asheville and Buncombe County in filling community needs through opportunities like We Care Experiences. VOLUNTEER: Consider allowing us to facilitate a We Care experience for your workplace.